The periosteum can be used as a barrier membrane for the treatment of endo-periodontal defect as periapical/periradicular bony defect in interdisciplinary dentistry. Gingiva is subjected to mechanical, chemical, and bacterial trauma which results in inflammatory reaction causing the gingiva to detach from the root surface and forms a periodontal pocket and/or gingival recession. Gingival recession is defined as the exposure of root surface in the oral cavity, resulting from the detachment and migration of the junctional epithelium toward the apex of the root. It is a common finding in populations with high standards of oral hygiene as well as in populations with poor oral hygiene. Gingival recession causes esthetic concern to patients, root hypersensitivity, root surface abrasion, high incidence of root caries, compromised plaque control, and esthetically compromised restorative treatment. The predictable coverage of exposed root surface with keratinized gingiva has been one of the goals in the periodontal surgery. Total coverage of exposed root surface remains a problem for most of the clinicians because avascular nature of the root surface hampers the ability of most of the graft to survive on the root surface. The objective of any health professional is not only to arrest and cure a disease process but also, if possible, regenerate any lost tissue, which is the goal of root coverage procedures. The efficacy and predictability of the various techniques are important considerations for both patients and clinicians. Among patient-related factors, an attempt to reduce the number of surgeries and surgical sites together which satisfy the patient's esthetic demand must be taken into consideration. Therefore, keeping this view in mind, the present case report was designed for the treatment of gingival recession by the periosteum inversion technique in terms of achieving predictable root coverage. 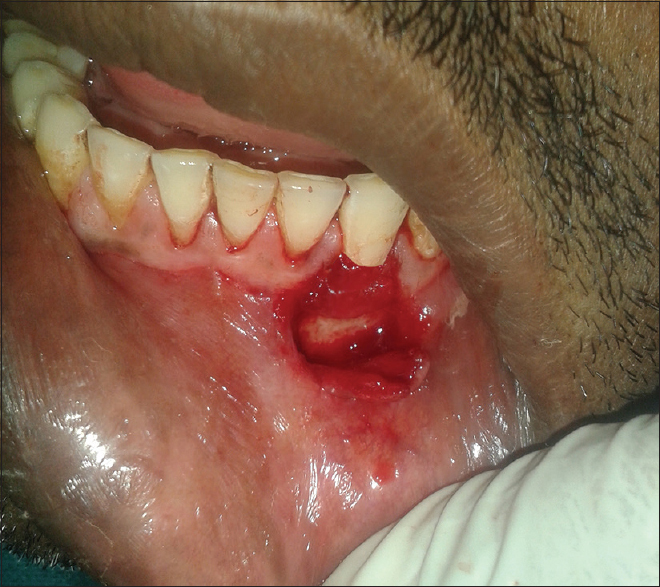 A 33-year-old male patient complains of receding gum in the lower front tooth region. On intraoral examination, a Miller Class I labial gingival recession at the lower left canine (#33) was present due to plaque and calculus deposition. The gingival recession depth was 3.5 mm recorded using UNC-15 periodontal probe measured from cementoenamel junction to gingival margin [Figure 1]. Gingival height was 2.0 mm when measured from apical portion of gingival margin to mucogingival line and probing depth was 2.0 mm when measured from bottom of the sulcus to the most coronal end of gingival margin. 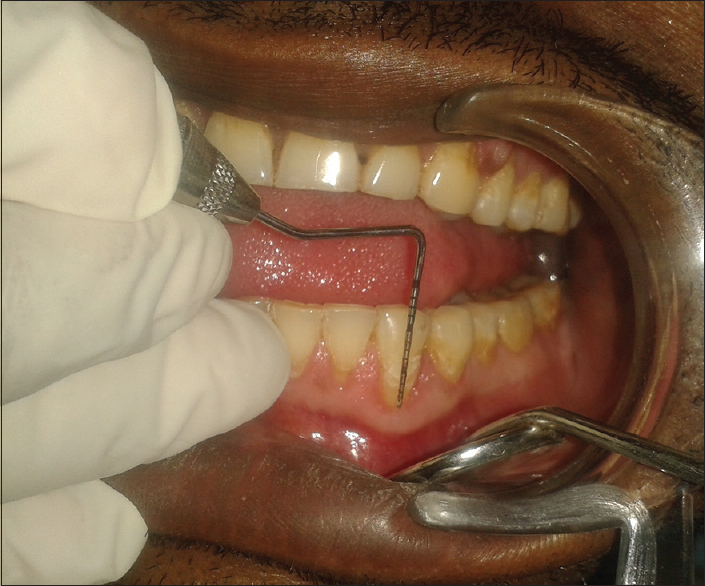 The patient underwent basic periodontal treatment of Phase I therapy including scaling and root planing and instructions for proper oral hygiene measures. A coronally directed “roll” technique was advised for tooth with gingival recession to minimize toothbrushing trauma of gingival margin. 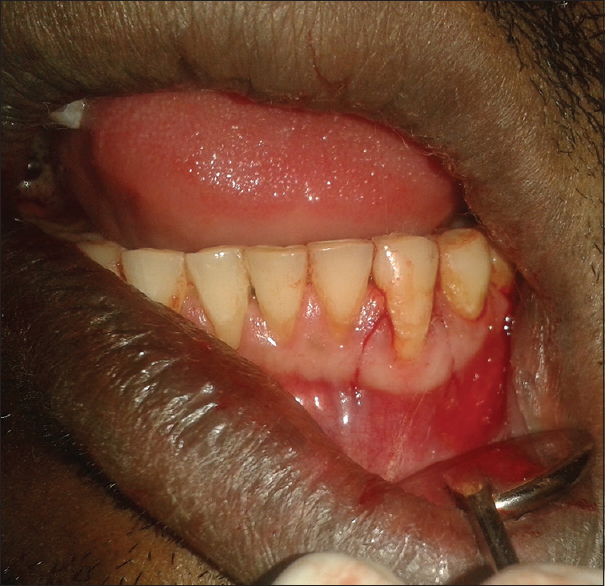 Surgical treatment of gingival recession was not schedule until the patient could able to maintain full-mouth bleeding score of ≤20% and full-mouth plaque score of ≤20% along with the absence of plaque, i.e., “plaque-free” (area where plaque could not be removed with a manual probe) and bleeding on probing at the surgical tooth site. Before treatment, surgical technique was briefed to patient and verbal and written consent was taken. This study was approved by the Institutional Ethical Committee for human subjects and also conducted accordance with the Declaration of Helsinki in 1975, as revised in 2000. The patient was instructed to do presurgical rinse by 0.2% chlorhexidine solution. The facial skin around the mouth was cleaned with spirit and scrubbed by 7.5% povidone-iodine solution. Intraoral surgical site was painted with 5% povidone-iodine solution. 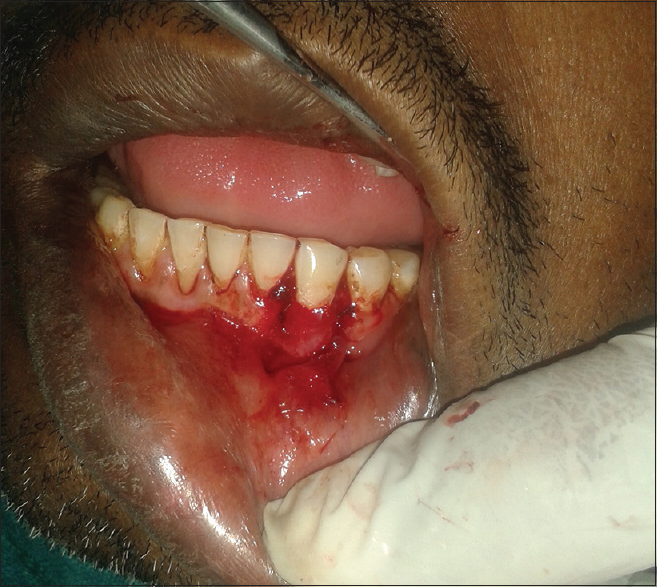 After proper part preparation, 2% lignocaine HCL with 1:80,000 adrenaline was administered to anesthetize lingual, labial, and inferior alveolar nerves of the lower left side. When local anesthesia becomes effective, two oblique vertical releasing incisions along line angle of tooth with gingival recession were made beyond the mucogingival line [Figure 2]. A partial-thickness flap was prepared [Figure 3]. The exposed root surface was cleaned thoroughly by scaling and root planing to remove any root surface deposits. An attempt was made to flatten the root in area of root prominence. A horizontal basal incision was given at the baseline to incise the periosteum at its apical end, and then, it was reflected from the alveolar bone, but margin remains pedicle crestly. The crestly pedicle periosteum was inverted coronally on exposed root surface [Figure 4] where it was sutured by sling suturing technique around the neck of tooth with 5-0 absorbable suture [Figure 5]. After that, partial-thickness flap was coronally advanced over the inverted periosteum and it was also sutured by sling suturing technique around the neck of tooth and by direct loop suturing technique on vertical incisions with 5-0 absorbable suture [Figure 6]. Finger pressure through a moist gauze piece was applied at the surgical site for about 10 min in order to close adaptation of tissue and to reduce the incidence of bleeding, microhematoma, or dead space. No periodontal dressing was applied to achieve direct chemical plaque control by mouthrinse. Antibiotic (amoxicillin 500 mg, 1 tablet every 8 h, for 7 days) and analgesic (nimesulide 100 mg, 1 tablet every 12 h, for 3 days) were prescribed. The patient was instructed to be extremely cautious during mastication at meals and not to brush the teeth in the treated area for 2 weeks but to use 0.2% chlorhexidine mouthwash twice daily for 1 min. 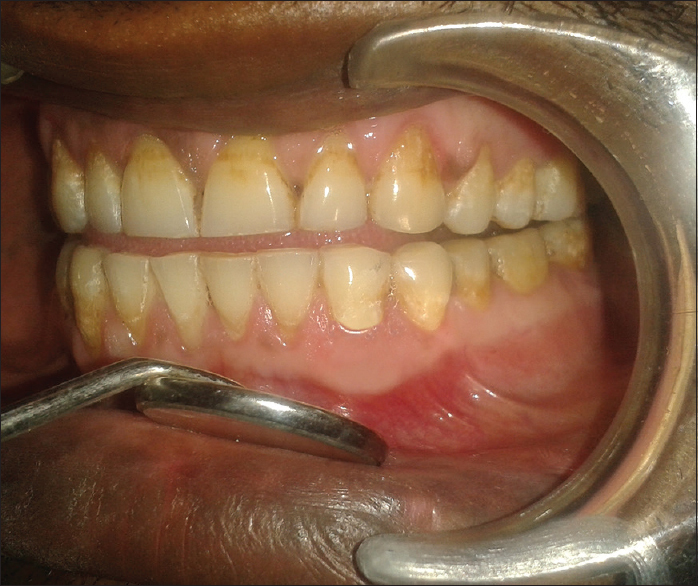 After this period, the patient was advised to mechanical cleaning of treated tooth region using an extra soft toothbrush by coronally directed “roll” technique, together with 0.2% chlorhexidine mouthwash twice daily, 1 min for more 4 weeks. After this period, routine oral hygiene procedures could be reintroduced. Clinical follow-up was performed once a week in the 1st postoperative month, every 2 weeks in the 2nd postoperative month, and once a month after that up to 12 months. At each visit, recall programs including professional tooth cleaning and reinforcement of daily oral hygiene measures were done. Healing was uneventful. The patient was satisfied with the treatment outcome. Complete epithelialization of the inverted periosteum was seen 1 week after surgery. As the postoperative time increased, the progressive adaptation and morphologic resemblance were observed. After 12 months, 3.5 mm, i.e., 100% root coverage, 5.5 mm of gingival height which is from gingival margin to mucogingival line, and 1.0 mm of probing depth were obtained [Figure 7]. The most critical phase of regenerative periodontal therapy is reattachment of collagen fibers to the root surface. However, regeneration of bone needs to follow reattachment of collagen fibers to the root surface. The normal anatomy of the periosteum includes an outer layer of dense collagen fibers, fibroblasts, fibroblast progenitor cells, and stem cells adjacent to soft connective tissue and an inner layer of osteoblasts, osteoblast progenitor cells, and stem cells adjacent to bone. Research shows cells of the outer layer of the periosteum can produce cementum with integrated collagen fibers when placed over dentin. In the periosteum inversion technique, cells of the outer layer of the periosteum which have ability to produce cementum and periodontal ligament are close to and cover the exposed root surface. In this manner, the first cells to populate the exposed root surface are cells of the outer layer of the periosteum. Thus, during healing, the cells with the potential to regenerate cementum and periodontal ligament are present to the exposed root surface. The cells of inner layer of periosteum, which have ability to form bone, are immediately behind the cells of outer layer of periosteum. Thus, after formation of cementum and periodontal ligament, they form bone. As a result, the periosteum inversion technique places the proper cells in the proper location for regeneration of the exposed root surface. In the adult, the inner osteoblastic layer is inactive and very thin. However, surgical release of the periosteum stimulates cells in both layers of the periosteum, and active cell multiplication occurs. Fibroblasts of the outer layer and osteoblasts of the inner layer and their progenitor cells respond to surgical release by a thickening of the periosteum and an increase in cellular activity. The periosteum eversion technique was reported by Singh and Kiran for coverage of denuded root surface. In the periosteum eversion technique, the periosteum is separated from the mucoperiosteal flap after baseline incision, so that the basal part of periosteum is used for eversion on denuded root surface for root coverage. The periosteum remains pedicle in the crestal part of the mucoperiosteal flap and can be elongated and coronally transposed over the denuded root surface without retraction forces. Thus, after eversion on denuded root surface, the outer layer of the periosteum comes in direct contact with root surface. Therefore, placement of the periosteum on root surface is same in both techniques. In both techniques, the periosteum retains its attachment. In the periosteum eversion technique, the periosteum remains pedicle in the crestal part of mucoperiosteal flap, whereas in the periosteum inversion technique, it is pedicle at the crestal/marginal part of the alveolar bone. The periosteum thereby retains blood supply and will survive on avascular root surface or even if exposed after surgery. Since the periosteum is attached to either the mucoperiosteal flap or bone, it can be sutured securely over the denuded/exposed root surface. The dimension and thickness of the periosteum vary in different areas of the mouth and between patients. Vital structures underneath the periosteum must be understood and considered during surgery. However, accessing the periosteum and acquiring the graft can be accomplished quickly and effectively with the proper training and experience. This surgical modality allows the practitioner to efficiently and effectively perform regenerative surgery on all surfaces for all teeth in a quadrant or mouth. The advantage of periosteum in this technique is that it is vascularized which is superior to free periosteum. The osteogenic capacity of vascularized periosteum is less affected by the environment of the recipient site as compared with free periosteum. Another advantage is that the configuration of the transposed periosteum can be adjusted to the shape of the recipient site. The only disadvantage is the chances of tear/perforation during the preparation of partial-thickness flap. This problem can be overcome by careful and gentle handling of soft tissue during the preparation of partial-thickness flap. The exposed root surface of gingival recession is a serious concern for functionally, structurally, and esthetically. The surgical technique of choice for coverage of exposed root surface of gingival recession depends on several factors, each technique having its own indication, contraindication, advantage, and disadvantage. The periodontist should choose least traumatic surgical technique among them with best esthetic result. The result of the periosteum inversion technique for coverage of exposed root surface of gingival recession was predictable. However, it is technique sensitive, especially in those cases with thin periodontal biotype. More work in future with the use of the periosteum inversion technique for coverage of exposed root surface of gingival recession is anticipated. 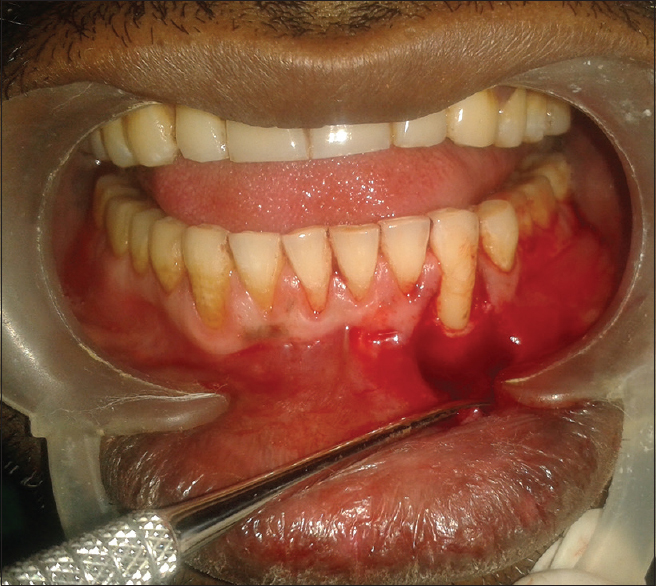 Dixit J, Singh AK, Nandlal, Gupta V. Treatment of gingival recession by three different surgical techniques: A comparative clinical study. J Indian Soc Periodontol 2006;10:194-200. Singh AK, Gautam A. Platelet-rich fibrin-reinforced periosteal pedicle graft with vestibular incision subperiostealtunnel access technique for the coverage of exposed root surface. J Interdiscip Dent 2016;6:33-8. O'Leary TJ, Drake RB, Naylor JE. The plaque control record. J Periodontol 1972;43:38-42. Singh AK, Kiran P. The periosteum eversion technique for coverage of denuded root surface. J Indian Soc Periodontol 2015;19:458-61. Youn I, Suh JK, Nauman EA, Jones DG. Differential phenotypic characteristics of heterogeneous cell population in the rabbit periosteum. Acta Orthop 2005;76:442-50. Groeneveld MC, Everts V, Beertsen W. Formation of afibrillar acellular cementum-like layers induced by alkaline phosphatase activity from periodontal ligament explants maintained in vitro. J Dent Res 1994;73:1588-92. Simon TM, Van Sickle DC, Kunishima DH, Jackson DW. Cambium cell stimulation from surgical release of the periosteum. J Orthop Res 2003;21:470-80. Steiner GG, Kallet MP, Steiner DM, Roulet DN. The inverted periosteal graft. Compend Contin Educ Dent 2007;28:154-61. Kumar Singh A, Saxena A. Treatment of periradicular bone defect by periosteal pedicle graft as a barrier membrane and demineralized freeze-dried bone allograft. J Clin Diagn Res 2017;11:ZD12-4.